Dissolves and binds the dirt which has been loosened by the ultrasonics. Type A �C General purpose, alkaline detergent suitable for all steels. Available in 1, 5 and 25 Litre containers. Type H14 �C Strong Alkaline detergent suitable for mould cleaning �C carbon removal and on steels, glass / ceramics. Available in 20Kg containers. Type N �C General purpose neutral detergent suitable for all materials including plastic. Available in 1 and 30 Litre containers. Type I �C Acidic detergent suitable for rust and oxide removal on all materials. Restores white ceramics. Available in 20 Kg. M99 �C Dewatering solutions which removes water moisture and protects. Available in 20Kg containers. For further advice on which cleaning solution to use, contact the sales desk. A cleaning and degreasing fluid with many of the performance characteristics of 1.1.1 Trichloroethane, but without the ozone depleting properties. 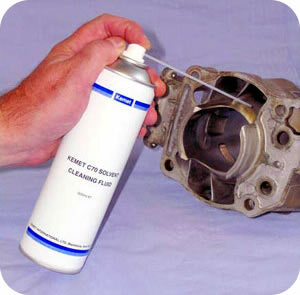 CO-42 cuts through contamination such as lapping and polishing residue, grease, oils and general surface contamination. CO-42 is relatively quick drying, but not so fast as to leave dried staining on the surfaces of products. The controlled wetting and evaporation properties of CO-42 make it extremely versatile and efficient. Able to act as an extremely efficient cleaning agent for all metals, most plastics, ceramics, glass and similar materials. Kemet C70 is a solvent cleaning and degreasing fluid with all of the characteristics needed to remove grease, oil and residues from parts. It is supplied in a pressurized container complete with detachable extended spray tube for reaching into the most difficult areas.